This in strument is a theta-theta diffractometer with a high-speed silicon strip detector. The Bruker Eco uses a high-brilliance 1 kW x-ray source for very low energy consumption, and does not require external water cooling. The silicon strip detector has 160 channels with 100x faster data collection compared to a standard scintillation counter, and the capability to suppress fluorescence effects from samples. The detector can also be used in a point mode to get enhanced signal from very weak diffraction peaks, by being positioned on a peak and accumulating counts. This X-ray diffractometer is used to analyze powders, bulk samples, polymers, and polycrystalline thin films. 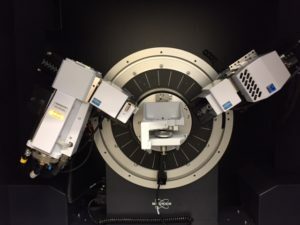 The instrument is used extensively for phase identification, which is done by comparing diffraction scans with the JCPDS database of ~250,000 patterns. Additional information that can be obtained through X-ray diffraction includes crystallite size, % crystallinity, quantification of phases in a sample, and lattice parameter determinations. Analysis of the diffraction data can be done using MDI JADE, an industry standard for XRD, or the new analytical software from Bruker, EVA.